OXFORD, Miss. 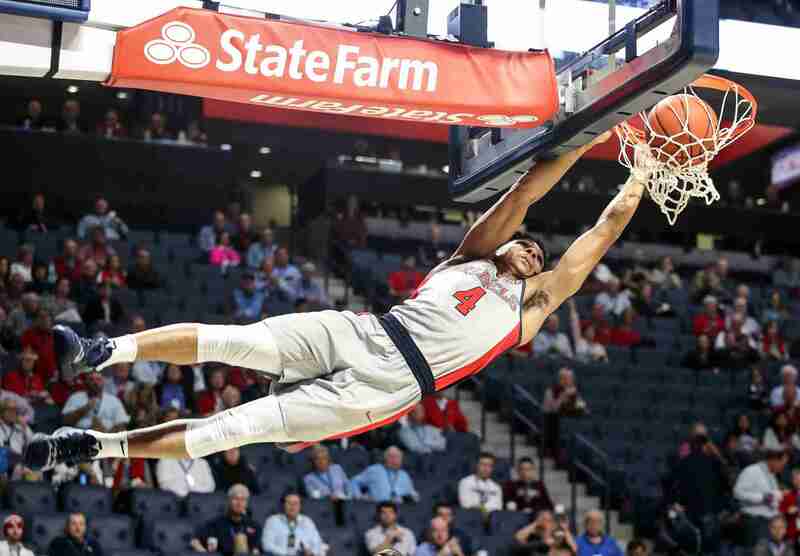 — The Ole Miss men’s basketball team defeated Texas A&M, 75-71, Wednesday night in The Pavilion. The Rebels move to 15-7, 5-4 SEC on the season. Breein Tyree opened the contest between the Aggies and Rebels by taking the ball straight down the court and slamming it home to give Ole Miss the first points of the game. Tyree didn’t stop there as he went on to score two more baskets and assist on a Bruce Stevens 3-pointer that put Ole Miss up, 19-6, just seven minutes into the ballgame. Not only was the Ole Miss offense pumping on all cylinders early, but the defense—just seven minutes in—had turned the Aggies over an impressive six times. At the halfway mark of the first frame, that total had increased to seven turnovers, and six Rebels had already put their name in the scoring column. Texas A&M went on a small 7-0 run to bring the Aggies’ deficit to within six points, but a well-placed Kermit Davis timeout got the Rebels back on track as a quick layup by K.J. Buffen and a monster slam by Terence Davis put Ole Miss back up by 10, 23-13. However, with just over 5 minutes remaining in the half, Texas A&M went on yet another 7-0 run to bring the game within reach. The Aggies started to heat up from the field, finding themselves down by only three points after a 12-2 run that made the score 29-26 with just a few minutes left before halftime. After hitting 8 of their last 8 shots in the first half, Texas A&M was down by only 1 point with one minute until the break. The teams entered halftime with Ole Miss holding on to a narrow 37-36 lead. First half stats: Both teams wound up being fairly even statistically following the first half, save for just a couple things. Ole Miss dominated the points-off-turnover battle, 18-11, while the Aggies had the edge on the boards, 16-12. Terence Davis notched 9 points in the opening half, while Hinson, Tyree, and Buffen all had six apiece. When the second half started, Ole Miss’ Blake Hinson and A&M’s Brandon Mahan traded 3-pointers, prompting an early Kermit Davis timeout with 18 and a half minutes still remaining in the contest. Following the timeout, the Aggies rode a 9-0 run all the way out to their first lead of the evening, 45-40. 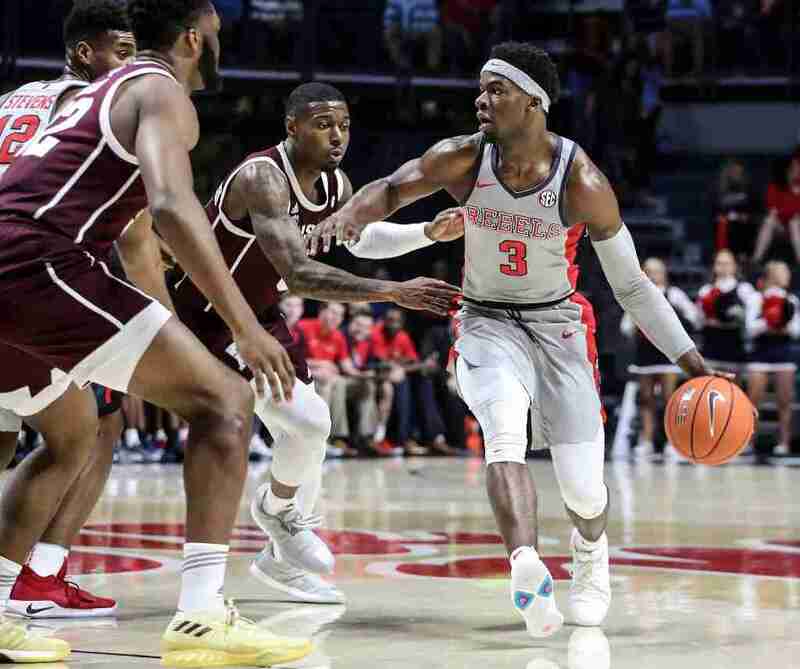 Luckily, an old fashioned 3-point play from Tyree and two made free throws by Terence Davis brought the Rebels back even with the Aggies at 45. Neither team seemed to be able to separate itself for several minutes following the initial media timeout—until the Aggies began to dominate the Rebels on both ends of the court. Mixing a three-minute scoring drought for Ole Miss with an Aggie team that hit 7 of its first 7 shots in the second half did not bode well for the Rebels as A&M held a 57-51 lead at the 10:52 mark. But as quickly as the Aggies heated up, they cooled off and couldn’t hit the side of a barn. A&M went 1-for-8 and allowed Ole Miss to get back into it, only down by 4 with just a bit over 7 minutes to play. With the help of a beautiful 3-pointer from Tyree, and a foul line opportunity on the following possession, the Rebels regained the lead, up by one, with 4 minutes and 30 seconds remaining. The Aggies struck right back as they hit a nice two-point jumper followed by a Terence Davis foul that sent A&M to the line. But the Aggies missed both free throws, and soon gave Hinson his own opportunity at the line where he hit both charity shots to give the Rebels the lead with just under 3 minutes remaining. Ole Miss relied on its free throw shooting for the remainder of the game—where they notched their final 14 points to close out a 75 to 71 victory over the Aggies (8-13, 1-8 SEC). Even though the Rebels did not hit a field goal for the final 5 minutes and 32 seconds of the game, their free throw shooting—14 for 14 to close the game—saved the evening in Oxford for Ole Miss. Eight Rebels scored in the game, led by three Rebels who scored in double figures: Breein Tyree with 22 points, Terrence Davis with 19, and Blake Hinson with 11 points. Ole Miss also notched 31 points off 18 turnovers which wound up being a huge key for victory. The Rebels will hit the road to Athens, Georgia in search of their sixth Southeastern Conference win of the season. The Rebels and Bulldogs will tip off at Noon (CT) and will be televised on the SEC Network.